Prices are per person, based on 2 people sharing a room. Single supplement applies(£133) for the trip. Geologically speaking, Namibia is undoubtedly one of the most interesting countries in the world. It not only offers the oldest desert, one of the largest canyons, some of the highest desert dunes and the largest iron meteorite, but also a large diversity of lesser known, but equally fascinating geological attractions. Geological features are immediately obvious and dominate the character of the country, allowing a view into a history of the earth. As relics of this geological history, Namibia’s bizarre rock formations and beautiful landscapes show evidence of various important geological processes: from ongoing weathering and erosion, previous huge mountain building events and sea level changes to gigantic volcanoes and the collision of whole continents. 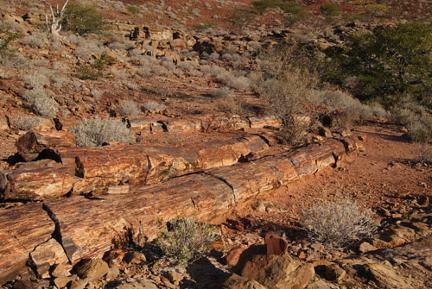 In addition, the rocky remnants exhibit evidence of all imaginable climatic extremes, which Namibia has experienced in its history; from ice ages and sub-polar conditions to hot tropical humid climates and hot dry red deserts. Therefore, Namibia represents a unique ‘geological Eldorado’ for professional geologists as well as for the non-professional. Day 1: Arrival in Windhoek. After meeting your geology guide Nicole Grünert at the airport we will leave for Windhoek, the capital of Namibia. You will be taken to a pension in the city centre. The afternoon is at your own leisure. We will have an early dinner at the famous Joe’s Beerhouse to get ready for a morning departure on the following day. Day 2: Exploring the Naukluft Mountains. We will leave for the Naukluft, a wild mountain region with spectacular geology. On the way you will see fascinating tufa waterfalls and limestone deposits. With a little bit of luck we can even encounter some mountain zebra or antelope on the way. We will sleep over at a guest farm. Approximate driving time: 4 hours. Day 3: Oldest fossils in the world. Today we see the oldest hard shelly fossils in the world. They age more than 500 million years and survived ice-cold times of the Snowball Earth Period! These little creatures are visible in spectacular mountain scenery together with fascinating stromatolite reefs. The overnight stay is at a cosy lodge. Approximate driving time: 2 hours. Day 4: Conquer the Namib Desert. Today we will head for the Namib Desert and visit the world-famous Sossusvlei. En route we will walk through the Sesriem Canyon and study the ancient forces of water in this desert landscape. At the Sossusvlei you have the opportunity to climb the dunes which are amongst the highest in the world and enjoy a spectacular view. Along the route different desert-adapted antelope can be discovered. We will spend the night in a lodge near the dune fields. Total driving time: c. 4 hours. Day 5: Crossing the Namib Desert. After getting to know why the Namib is regarded the oldest desert in the world, we will leave for the coast. Along the route we will not only cross the Tropic of Capricorn, but also visit some spectacular desert geology. At the coast, we will stop at the Walvis Bay Lagoon and besides geology we can spot sea-birds such as pelicans or flamingos. The rest of the day is at your leisure in the cosy coastal town of Swakopmund. After a good dinner in a local restaurant, we will stay at a pension for the next two nights. Total driving time: 4 hours. Day 6: Activities at the Coast. As Swakopmund and surroundings have a lot to offer, we will have a geology-free day! There are plenty of options, including a morning catamaran cruise around Walvis Bay or an afternoon scenic flight over the Namib, as far as Sossusvlei. (These activities are at extra costs). Alternatively the day can be spent visiting the museum, aquarium, snake park or just relaxing at the beach or at one of the café’s. At the end of the day, we will meet at the Tiger Reef Bar for a sun-downer before we enjoy a good dinner in one of the numerous restaurants. Day 7: Explore the mountains of the west. After crossing the Namib, this time from west to east, we will head for the Erongo Mountains which are well-known for their richness in minerals. We will explore some spectacular granite weathering formations and discover the origin of this former volcano. Depending on the time we can also find some bushman paintings hidden in this mountain landscape. Tonight we sleep at one of the guest farms in the area - typical of Namibian hospitality. Approximate driving time: 2 hours. Day 8: Vast landscapes and mountains. Today we head towards the Brandberg, the highest mountain in the country. After having the opportunity to purchase mineral specimen from local vendors, we will drive past Spitzkoppe, the Matterhorn of Namibia. In the afternoon, we visit the abandoned Uis Tin Mine, which was once the largest hard-rock tin mine in the world. We will spend the next two nights night near the former mining village of Uis. Total driving time: c. 3 hours. Day 9: The Brandberg, highest peak in Namibia. 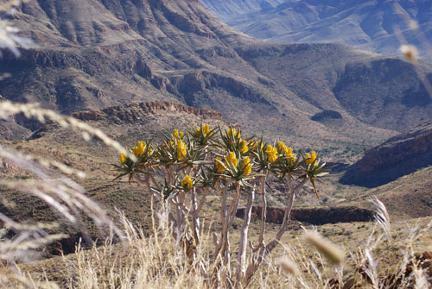 The Brandberg area is one of the most fascinating geological regions of the country. We will observe evidence of volcanic action separating the Gondwana Continent, visit some small scale miners and also see the world famous Welwitschia mirabilis plant, the living fossil of the Namib Desert. At the end of the day, we return to our accommodation for the night. Total driving time: c. 4 hours. Day 10: Damaraland, World Heritage Site Twyfelfontein and Petrified Forest. Besides visiting the Petrified Forest, we will explore Namibia's first World Heritage Site at Twyfelfontein, with its fantastic rock engravings made into 180 million year old desert sandstone. The larger area is home to desert-adapted elephants, black rhino and lions, although spotting these animals is quite rare. We will spend the night at a lodge. Approx. driving time: 3 hours. Day 11: Etosha National Park. 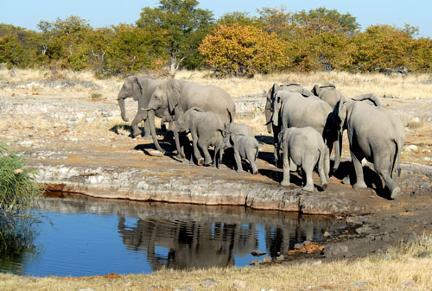 The next two days are reserved for game viewing in the world-renowned Etosha National Park. Nevertheless, along the way we will stop at the Vingerklip, a striking rock column. Besides numerous game species, we hope to spot some black rhinos at the floodlit waterhole at the Okaukuejo Camp at night. Please be aware that it is forbidden to exit the vehicle within the park (except the camps). Therefore we will be driving most of the next two days. Day 12: Etosha National Park. We will spend the day crossing the park in an easterly direction looking for antelope, zebra, lion, elephant, rhino and other interesting species. In the late afternoon we will leave the park for our accommodation at a guest farm outside the eastern border of Etosha. Day 13: Tsumeb, a mineral collector’s paradise. Today we will visit the mining town of Tsumeb. Besides having been important from an economic point of view, the Tsumeb mine is world famous for its wealth of fascinating mineral specimens. These are displayed at the Tsumeb Museum, which also offers a good insight into the colonial history of Namibia as well as the different indigenous cultures living in the country. In the afternoon a visit to the largest iron meteorite is scheduled before we head towards the Otavi Mountains. Our last stay in the bush is at a guestfarm. Total driving time about 2 hours. Day 14: Dinosaur Footprints. Today we head back to Windhoek via the main B1 tarmac road. The long drive (approx. 4.5 hours) is interrupted by a visit to the dinosaur footprints of Otjihaenamaparero. If time permits we will also stop at the woodcarvers market in Okahandja. In the early afternoon we will check in to a pension in town and you have the opportunity to explore the Namibian capital on your own. In the evening we will have dinner together in a local restaurant. Day 15: Geological Museum and Departure. Before we take you to the International Airport we will visit the Geological Museum in town. Interesting displays of Namibian earth history, the mineral and fossil richness as well as information about the major mines will neatly summarise our geological tour through Namibia.